Daddy longlegs, Shepherd spiders, Harvestmen, Grandfather greybeard. These are just some of the common names for the Arachnid Order Opiliones (formerly Phalangida). 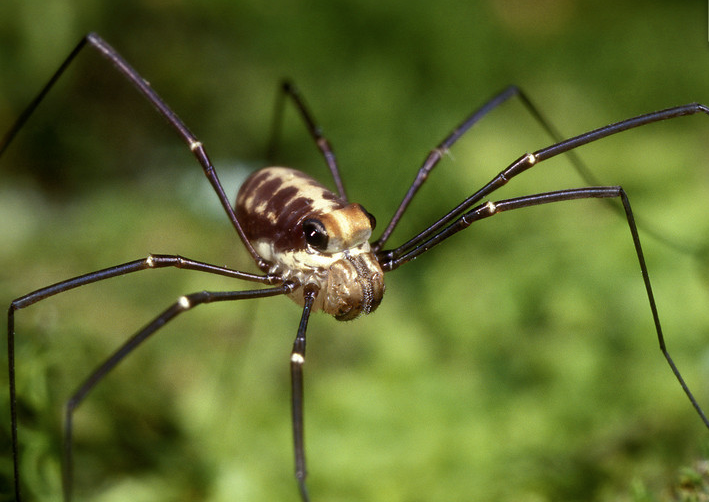 Although there are over 6,000 described Opiliones species, they remain relatively poorly known. 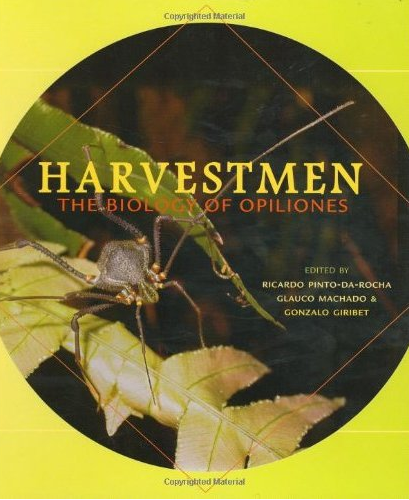 That is until a few years ago… In 2007, Ricardo Pinto-da-Rocha, Glauco Machado and Gonzalo Giribet published “Harvestmen: The Biology of Opiliones“. This tome comes in at just over 600 pages, and it is a magnificent achievement. The book assembles and synthesizes a wealth of information on Harvestmen, including their cultural and historical importance, functional anatomy, reproductive behaviour, biogeography, taxonomy and systematics, and more. I have been quite fascinated by Opiliones for a long time, and find myself drawn to their awkward gait, and their unusual biology. I am also always keen to learn more about all kinds of Arachnids, and I am embarrassed that I don’t know how to identify these lovely animals. For these reasons, I purchased the aforementioned book, and started reading it. I must be honest, it’s a very expensive book making in hard to justify for the “casual biologist” and I am privileged to be able to afford it. It’s also very dense, and although information rich, is not entirely accessible to non-arachnophiles. I am on a continual crusade to share knowledge about Arachnids with anyone who will listen. And, like spiders, there is a lot of misinformation out there about Opiliones. I want to invite you into the wonderful world of Opiliones, and I will do this by sharing small snippets of this textbook with you. I’ll call this endeavour “The Opiliones Project” and my goal will be to bring you along to learn some interesting facts about the Opiliones as I wade through the different Chapters. This is not an entirely altruistic process, as by committing this to you, it also gives me incentive to read carefully, and with an eye for detail (something I don’t typically have time to do!). 1) To take part, you need a Twitter account and an Internet connection. 3) This will be a slow process, and will likely take several months. 4) I will paraphrase details from the textbook, and unless indicated otherwise, the ‘citation’ for this project will be: Pinto-da-Rocha et al. 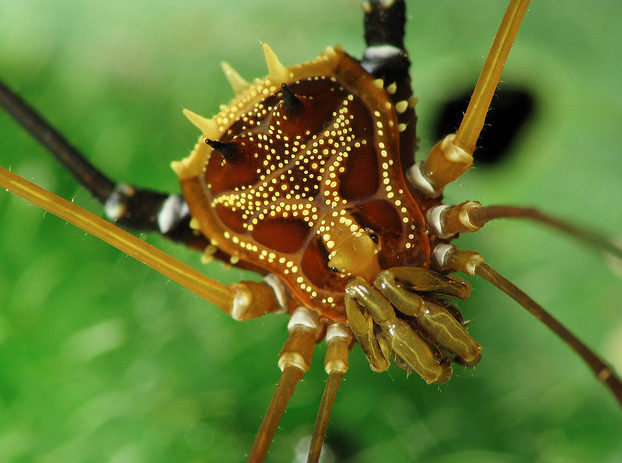 (2007) Harvestmen: The Biology of Opiliones. Harvard Univ. Press. You can, therefore, fact-check by looking at the book, and I will welcome this opportunity (oh, and in case you are wondering, Ricardo Pinto-da-Rocha is 100% supportive of this project). Now and then I will also try to bring other primarily literature to the discussion. Interested? if so…. please follow this project on twitter using the hashtag #OpilionesProject (I will tweet from my account @CMBuddle) – and please join in the discussion using that hashtag – the more interaction, the better. Once finished, I will assemble all the tweets on storify. Sounds like a great project! Opiliones are definitely worth knowing more about, and that book is an amazing resource. I always get a hold of it via an interlibrary loan though, due to the expense, which you mentioned. It’s great to see someone trying to share it with others. I’ll be sure to follow along. Thanks for the comment – I am learning a great deal, and hope others are finding it interesting, also. OMG……first I’m so in! Second I hope to one day get a copy of this book Third I’ll see you on twitter. Fourth I don’t know too much on Opilionids so this’ll be a wonderful opportunity to learn more. I used to play with them all the time when I was a kid…..used to find them everywhere…..not so much anymore but this year I’ll keep a special eye out for them. LOTS of spiders though. Oh I’m rambling ^^ Excited! !